The Yazidis are an ethno-religious group whose largest communities lived in northern Iraq until recently. There are differing opinions about their origin. Some evidence suggests that Yazidism arose on the foundation of ancient Indo-Iranian beliefs. However, like any other religion, Yazidism developed and transformed. Yazidis passed on their religion, history, cosmological ideals and legends from one generation to another orally. 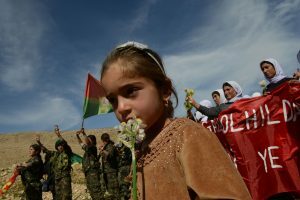 Since the emergence of Islamic State (IS) in Iraq and neighbouring Syria in August 2014, the group has been increasingly targeted by Islamist forces who have killed thousands and enslaved thousands more women. Thousands of Yazidis are seeking asylum and hoping to start a new life.